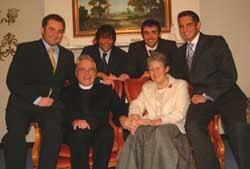 The Rev Jack Richardson, his wife Sally and sons L to R: John, Neville, Alan and Jeff pictured in Hillhall Manse prior to his farewell service in Hillhall Presbyterian Church on Sunday 24th December. John Connor, Clerk of Session (centre of picture – back row) pictured with the Richardson family prior to the final service in the active ministry of the Rev Jack Richardson in Hillhall Presbyterian Church on Sunday 24th December. L to R: The Rev Craig Wilson - Assistant Minister and John Connor - Clerk of Session, welcome the Mayor and Mayoress to Hillhall Presbyterian Church for the final service in the active ministry of the Rev Jack Richardson on Sunday 24th December. After nearly 25 years of loyal service as the minister of Hillhall Presbyterian Church, the Rev Jack Richardson BA, BD conducted an emotional final service in his active ministry on Sunday afternoon 24th December (Christmas Eve). The Mayor - Councillor Trevor Lunn and the Mayoress - Mrs Laureen Lunn were among the many friends and well-wishers who packed the church to capacity, with up to 200 people listening to the service in the adjoining church hall and choir room. Steven Barrett on organ, Mrs Maxine McConaghy on piano and Hillhall Church Choir led the praise. The carols were Hark the herald angels sing, Away in a manger, In the bleak midwinter and As with gladness men of old. The anthems were - Christmas greetings and Rejoice and be merry. The Young people’s praise group accompanied by Claire Mitchell sang - Love came down at Christmas. Soloist Cara Curran sang - How beautiful are the feet (Messiah) and O Holy night. Readings were by Maree Gillespie and the Mayor - Councillor Trevor Lunn. The Rev Craig Wilson led the prayers of adoration and thanksgiving. During the service, little 13 week-old Zara Grace, infant daughter of Glenn and Sue Montgomery was baptised, this was the last baby to be baptised during Mr Richardson’s ministry. Organists - Lorraine Smyth, Steven Barrett and Mrs Maxine McConaghy pictured with members of Hillhall Church Choir at the final service in the active ministry of the Rev Jack Richardson in Hillhall Presbyterian Church on Sunday 24th December. Soloist Cara Curran who sang at the final service in the active ministry of the Rev Jack Richardson in Hillhall Presbyterian Church on Sunday 24th December. 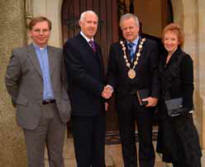 John Connor, Clerk of Session, welcomed the packed congregation and gave a special welcome to the Mayor and Mayoress. In his farewell to Mr Richardson he said that he had “given unstinting of his time and energy to minister to the pastoral and spiritual needs of the congregation. He gave himself to the Lord’s work completely, often thinking little or nothing of his own needs in the process and we as a congregation have been richly blessed and greatly enriched by his Christ like ministry to us. Ably supported by his devoted wife Sally, they have been a great team throughout their ministry in this place. Mrs Richardson is a quiet gracious lady who works away quietly behind the scenes, never seeking the limelight in any way. She has been so supportive of her husband during his ministry. Mr and Mrs Richardson have been exemplary role models as to what a minister and a minister’s wife should be. They are greatly respected and much loved by all of us. 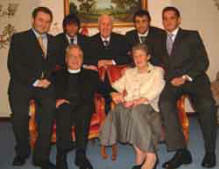 We thank them both for their friendship and pastoral care and for all that they have done for us”. Mr Connor wished Mr and Mrs Richardson and their four sons Alan, Jeff, John and Neville a very happy Christmas and concluded by wishing that Mr and Mrs Richardson would be long spared to enjoy a fulfilled retirement, and that God would bless them in the days ahead. In a challenging farewell sermon entitled ‘It’s all about Jesus’ Mr Richardson said that a Presbyterian church existed in Lisburn since the early 16th century and that Hillhall congregation was formed around 1750. He said that the church is not just a building - it is the people of God worshipping in the name of Jesus. Referring to Philippians 2 v 5-11 as read by his secretary Maree Gillespie, he spoke of the Humanity and Divinity of Jesus and the challenge of growing up and living a perfect life. “Jesus means Saviour” he said, “He left the Glory of heaven to die a perfect sacrifice for our sins, so in a real sense, its ALL about Jesus”. He explained that during his 24½ years at Hillhall he had endeavoured to lift up Jesus saying “If I be lifted up, I will draw all men unto me - that is the task of Hillhall Presbyterian Church past and present”. Recalling the beautiful evening of 4th June 1982 and the large marquee erected at the church when he was installed as the minister of Hillhall he spoke of the family spirit that he inherited and of the high privilege to be their minister for such a long time. “I have shared so many happy and sad times with so many members of the congregation and have ministered to needs from the cradle to the grave - I have baptised so many, married so many and shared in the development of so many from childhood up to mature adulthood. That’s life - Sorrow and joy, tears and laughter”. Referring to Dickens’s novel ‘Great Expectations’ he spoke of the links in the chains of live and the obstacles as well as the joys of life. Recalling many visits to over 500 homes in which he had been made so welcome, he said, “You are a special people and you will always be a special part of our lives”. He gave thanks to John Connor (Clerk of Session), Congregational Committee, Kirk Session, Sunday school superintendents and teachers, leadership in the various stages of Scouts and Guides, Christian Endeavour, caretakers, choir, praise group etc. Referring to the support of these and many others he paid a special tribute to their organist, the late Gerald Woods, who regrettably died recently. Asking the question, “Who’s church is it?” he replied, “It’s Christ’s Church, because - It’s all about Jesus”. Hallelujah! - what a Saviour!